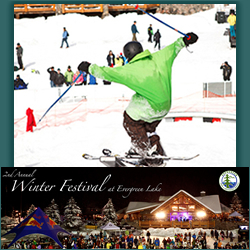 Evergreen Park & Recreation District (EPRD) presents the 2nd Annual Winter Festival at Evergreen Lake, the Denver metro area’s premier winter sports and fun extravaganza, brought to you by Never Summer Industries. Amateur and pro skiers, snowboarders and mountain bikers compete on and around Evergreen Lake. The all-day, family-friendly festival also features afternoon Fun Time, an ice fishing derby, snowman walk, snow slide, tractor rides, music, food and drink – and closes with a thrilling nighttime fireworks display over the lake.